For publishers the world over, being able to rise above the noise of tens of thousands of other affiliates to promote a commercial opportunity that needs to be filled is no mean feat. Bringing these unfilled gaps out to advertisers is part of the publisher’s day-to-day operation, while looking for ways of optimising an affiliate programme through new partnerships is part of the brand’s. Whether the tasks of offer promotion and programme optimisation will ever be made easy is up for debate, but last month saw one of Europe’s biggest affiliate networks wade in on both scenarios with a new tool. Affiliate Window’s Opportunity Marketplace has been released under the description of an easy-to-use directory for hosting on-site offers, capable of serving both advertisers and publishers. This week PerformanceIN spoke to product manager Sophie Cook to find out more about what sort of opportunities it can offer. Who is the Opportunity Marketplace aimed at? Sophie Cook: The Opportunity Marketplace benefits both our advertisers and publishers. It is primarily aimed at our publishers – it provides them with an easy-to-use tool to promote all the opportunities and promotions they have available. This is especially beneficial for our smaller and newer publishers, who perhaps are not so well-known and find it harder to get their opportunities in front of advertisers. The Opportunity Marketplace is also a great platform for advertisers to discover new partnerships that they may not otherwise have been aware of. And instead of having lots of contact with individual publishers, they can use Opportunity Marketplace to highlight and make offers on the opportunities they think will make a difference to their programmes. What are the key features on offer? SC: The Opportunity Marketplace lets publishers list, manage and promote all of the advertising options available on their websites. They are then viewed and considered by our advertisers in an easy-to-use directory. When browsing the directory, advertisers can filter by opportunity type (i.e. sponsored content, newsletter placement etc. ), by programme status, sector and region. Once advertisers have found an opportunity that they want to take part in, they can use our interface to make the publisher an offer on that opportunity. Publishers have long been lacking a marketplace like this. Why is 2015 the right time for it? SC: Affiliate marketing is evolving, and over the last year particularly, we’ve really seen the growth of email placements, homepage takeovers, sponsored content and sponsored social posts across our network. It’s important that an affiliate network provides publishers with the right platform to ensure their proposition gets noticed by advertisers. Getting in front of the right advertisers is a very important aspect of making a proposition successful. We wanted to create a platform which makes it easy for publishers to showcase their diversity and make it easier for an advertiser to find all the opportunities our channel has to offer. Have any themes ran through your feedback from advertisers? SC: Advertisers have been very positive about the new tool and in particular have been impressed with the quality of promotional opportunities coming through the Opportunity Marketplace. 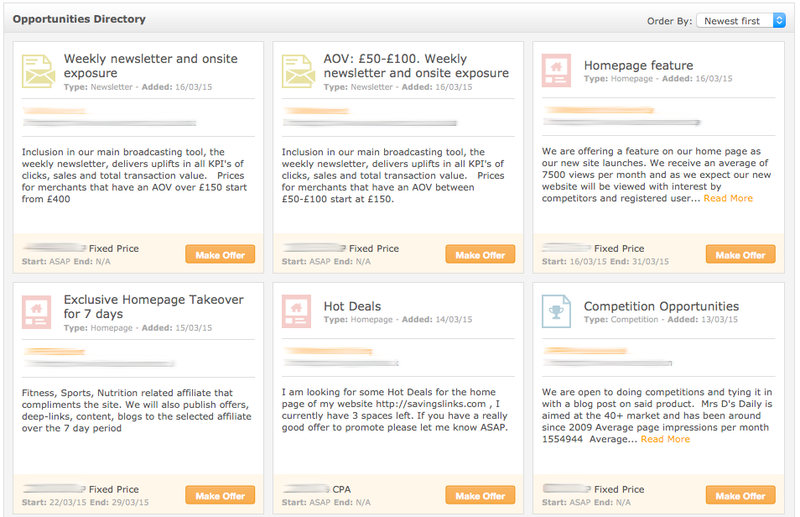 Many advertisers have said that the tool has highlighted new publishers that wouldn’t otherwise have been spotted. They’re also very happy with the pro-activeness of the publishers that they’ve dealt with through the marketplace. Is there anything you’re definitely looking to add to the initial build? SC: Yes, the Opportunity Marketplace is still in its early stages. We’ve got lots of improvements on the roadmap including search functionality in the directory. Since launch we’ve been listening closely to our user feedback so that we continue to develop the product with their needs in focus.